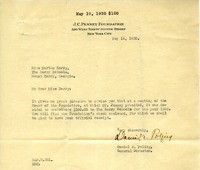 Daniel A. Poling encloses a check from the J. C. Penney Foundation, which was decided upon at the meeting of the Board of Trustees. 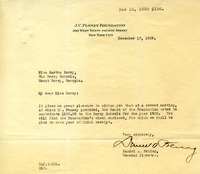 Mr. Peling writes to advise Miss Berry that the Board of the J. C. Penney Foundation voted to donate $100 to the Berry Schools. 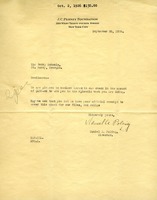 Daniel A. Poling sends a check for $150 and asks for an official receipt for his files.